Do you have the luck of the Irish, if not, do you want it? Of course you do! Irish themed slot games are to games developers as macaroni is to cheese – they go hand in hand! Tales of Leprechauns and rainbows with pots of gold at the end, and four-leaf clovers gives the perfect setting to a gambling game. Are you ready to head to the Emerald Isle and try your luck on online bingo casino? Eyecon have been a bit of a slow burner when it comes to being recognised for their slot games, even though they were founded in 1997 – and Playtech is its parent company. But it is slowly starting to be recognised for its variety of online slot games, as it has over 100! Their games are starting to become easier to find, so when you do, try out some of their other Irish inspired game: Fiddle Dee Dough at BarbadosBingo.com. Irish Luck has the classic theme appropriate setup, it’s set in a quaint fairytale like forest with a rainbow, a pot of gold and a Leprechaun up above the reels. On the reels you’ve also got the Irish symbols like castles, four-leaf clovers, pints of Guinness, trees filled with gold, rainbows, cobblestoned paths and what looks like a pixie fairy. Wild symbol – the four-leaf clover is the wild symbol and substitutes for all other symbols on the reels except the scatter. When the symbol ‘substitutes’ and wins, it doubles your winnings! Scatter symbol – the Leprechaun is the scatter, and landing 3 or more of him in one spin will trigger the ‘prize pick’ bonus. Prize pick bonus – triggered by landing 3 or more scatters, this round presents you with stumps. You have to pick out of the stumps, and they will reveal prizes – if you reveal a Leprechaun you’ll be awarded with 10 free spins, and if you reveal a fairy you’ll be awarded with multipliers up to 100x. Match and win bonus – triggered by landing 3 or more fairy symbols in one spin. You’ll see a screen full of clovers, and you keep picking them until you reveal matching symbols – the round won’t end until you reveal a set of matching symbols, and the symbols will determine your prize. 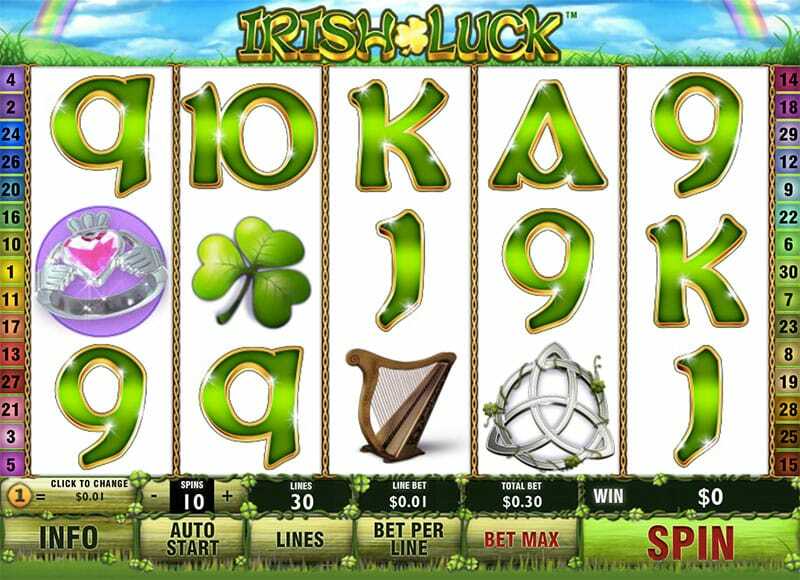 Irish bonus – the lower value symbols on the reels are letters, and if you manage to spell out I-R-I-S-H across the reels you could win a multiplier of up to 3000x. 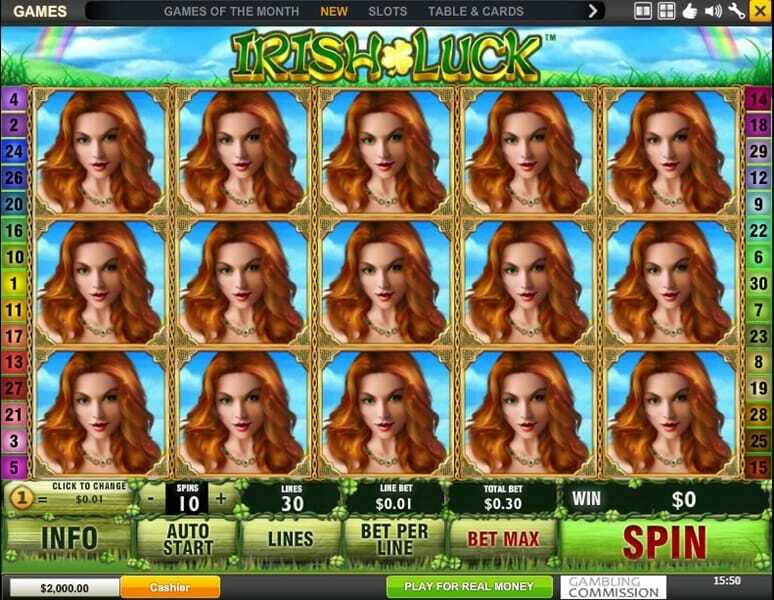 Gamble feature – like many slot games, this Irish Luck slot also has a gamble feature for when you’re feeling extra lucky. You can’t go wrong with an Irish themed slot game here! The amount of lucky stereotypes the country has gives the perfect setup for an online game. This game from Eyecon doesn’t disappoint, with plenty of bonus features to keep it interesting (particularly the added bonus of the spelling feature), and the game has an RTP rate of 95.05%. Another exciting game with high RTP rate and demand you definitely should try is Mega Moolah game slot.